Gravesend. Mr. Sidgwick joined the L.G.D. in 1935, and has held various senior managerial positions within the Group. He has recently been responsible for a complete rationalization and reorganization of the activities of the ship repairing divisions. The board is also authorized to modify the bylaws so that they reflect the true amount of the capital stock of the company. The invoicing of the companies which are 100 percent within the Astilleros Group repre- sents 29,250 million pesetas. The type of vessels were 230,000-dwt, 110,- 000-dwt and $35,000-dwt tankers; 53,000-dwt, 35,000-dwt and 27,000-dwt bulkcarriers, and 19,000-dwt cargoliners. These include the tank- ers for Iraq. The construction of a large dock in the new repairing center in the Bay of Cadiz continues as anticipated and will be in operation at the end of this year. 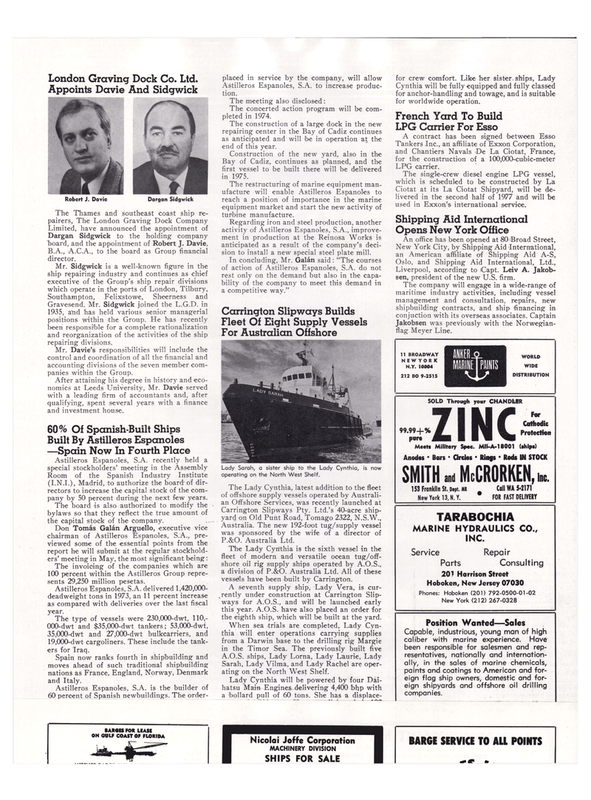 Bay of Cadiz, continues as planned, and the first vessel to be built there will be delivered in 1975. The Lady Cynthia is the sixth vessel in the fleet of modern and versatile ocean tug/off- shore oil rig supply ships operated by A.O.S., a division of P.&O. Australia Ltd. All of these vessels have been built by Carrington. A seventh supply ship, Lady Vera, is cur- rently under construction at Carrington Slip- ways for A.O.S., and will be launched early this year. A.O.S. have also placed an order for the eighth ship, which will be built at the yard. Liverpool, according to Capt. Leiv A. Jakob- sen, president of the new U.S. firm.